48" ElectroFence Gates allow for quick access in or out of the paddock. Simply lift the handle, remove the post from the dock and go on through. For a shorter gate, look to 35" ElectroNet gates. This a complete gate that can be added to the ends of existing nets (or between permanent fences) and electrified. Gate post locks in place via a handle and docking station. Stainless steel clips at each end of the gate provide electrical connections to netting. Gate's drivable posts can be used in hard soils. Same mesh spacings as ElectroFence but with tighter verticals, 6" instead of 12". 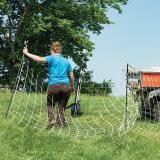 For entering/exiting semi-permanent or perimeter sheep/goat paddocks without having to turn off the fence energizer. 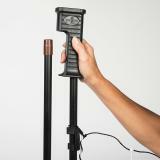 Can be easily angled out from gate posts to guide the flock or herd in or out of a field. Horizontals are white/black or green/black. Horizontal spacings from bottom to top are: 4", 4", 4", 4", 4", 4", 6", 6", 6", 6". 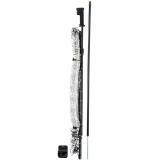 Verticals are white plastic struts placed every 6". Contains gate, posts, handle & docking station. Drivable posts are .75" PVC with a metal spike that goes into the ground. Keeps in or stops: sheep, goats, cattle, coyotes, foxes and bear. Two more conductive strands than ElectroNet Gates—better for semi-permanent and perimeter fences, or for fences with high predator pressure. Drivable posts—can be inserted into hard soils with the help of a mallet or dead blow hammer. 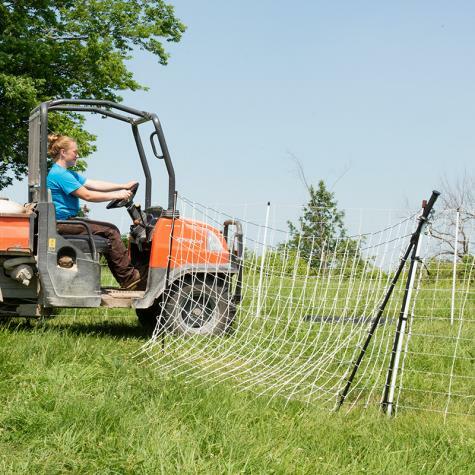 If the gate is to be used in the middle of a fence line, and power needs to be carried across, simply use a PowerLink to carry the power over to the continuing section of fence. The gate is pricey but it works very well. I'm happy with it, easy to use, and will buy another one soon. The electric 200 feet of electric netting is exactly what we needed to protect our sheep from coyotes. The only weak link is the gate closer. We have difficulty having it not fall down. The gate was a great choice for our livestock and activities. With two tenacious mini donkeys needing lots of walk abouts and whom also help us carry loads of tools and weeds around the farm having an easy in and out without having to turn off the power or pull a stake in and out of clay soil is super handy. Having more freedom in our comings and goings has been a huge help in our care and pasture management of our livestock. Really great fence. I love how durable and solid it feels. I took one star off because the fence is almost impossible to open one handed. Which more often than not I am attempting to do. Also if you're worried about keeping skunks, raccoons, and opossums out then you'll have to get the poultry fence because those critters can slip right through the weave of the fence.